This pesto summer squash recipe is from The Easy Vegetarian Cookbook. The original recipe is doesn’t call for the egg, but with the addition, this meal becomes the perfect lunch or light dinner. To make the squash, light the grill to medium-light heat. Slice the squash into 1/2 slices. Brush the squash and onions with olive oil and sprinkle with pepper. Grill 2 to 3 minutes per side until charred. Remove from grill, let cool slightly, cut the squash into cubes, and dice onion. To make pesto: In a food processor, pulse the garlic. Add the basil, Parmesan, pine nuts, olive oil, and lemon juice. Pulse until well combined, adding more liquid (olive oil/lemon juice) as needed to thin the consistency. Toss the grilled squash mixture with 1/4 cup of the pesto. Divide the squash mixture over the two pieces of toast. 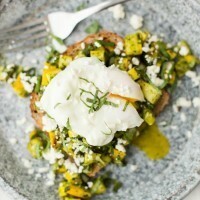 Finish with the poached egg, feta, and a sprinkle of basil.